Harwich ferry port is located on the south bank of the river Stour in essex. It is a modern and very efficient port with 4 crossings per day to Holland. Hook of Holland is a district of Rotterdam on the North Sea, located 48 miles from Amsterdam. 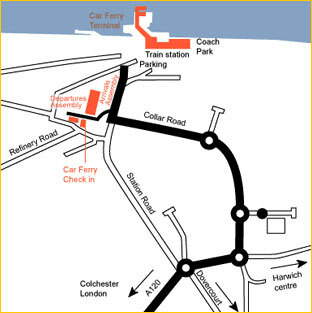 It is a terminus for ships that cross the channel from Harwich, the only passenger route to the Hook of Holland, and is operated by Stena Line with crossings up to 3 times daily. Amsterdam and all other major Dutch cities are easily accessible from this port. The ferry service is an ideal gateway to the rest of Holland and Northern Europe by train or travelling in your own vehicle. The Amsterdam Express and local rail services arrive directly outside the terminal building. 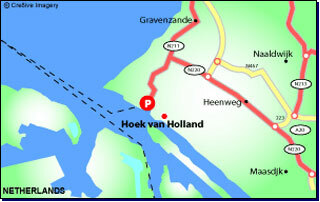 Directions to Hook van Holland Ferry port by car. The Excellent E30/E25 network of motorways links the Hook of Holland port with Amsterdam, Rotterdam and the rest of Holland. Join the motorway and follow the signs to "Engeland" and "Hook van Holland".